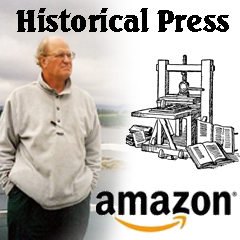 The Bay County Historical Society (BCHS) was formed in 1919 with the intent of promoting the preservation, collection, and study, of Bay County's story. For almost 100 years the Society and its Museum have collected artifacts with that purpose in mind. Many articles are brought to the Museum each year by individuals who wonder if they are worth collecting. Of those, about 40 a year will have the unique characteristics, provenance, and local connection to be added to the collection, which now contains almost a quarter million artifacts! All submissions from the public are interesting, even if they don't meet the criteria to be collected. Of the hundreds of individual objects, each has its own story to tell about the unique history of Bay County. The following excerpt from the BCHS E-newsletter is a feature that explores the miscellany of recently donated items. Each artifact tells a tale that contributes to the larger narrative of Bay County's past and present. These articles are written to take readers beyond the galleries for a glimpse at the Museum's extensive holdings. Kirchman Bros Co. began in 1904 when brothers Ignatius and Frank Kirchman took their individual skills, acquired through attending Business College and employment in wholesale grocery companies, and pressed them into service to create a company that was a leading wholesale supplier of merchandise to small town general stores in northern Michigan. Twenty years later they would transition into the food service equipment industry catering to northern Michigan resort towns, a field they would be solely devoted to by the late 1940s. 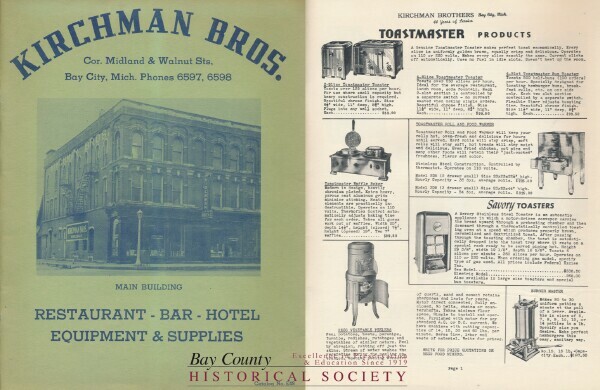 Kirchman Bros. Co. supplied everything a restaurant, bar or tavern could need; from toasters and ovens to dishes and drinkware, booths and chairs to menu covers and check books, prep bowls, and utensils to dishwashers. This catalog, circa 1949, was donated to the society earlier this year and shows the building Kirchman Bros. occupied at the corner of Midland and Walnut Streets from 1914 to 1993. The company, which continued to be family owned and operated, moved to Wheeler Road for the last decade of operation. Shown here are the catalog cover and a page displaying items available for order. I came across your article by accident and was pleasantly surprised. My grandfather was Ignatius Kirchman, one of the two founders of Kirchman Bros. My father, Hubert (Hub) Kirchman and his cousin Frank, son of the other founder (also named Frank) took over the business as partners after their fathers passed away. My father eventually sold his share to his cousin and we moved to CA. We still have some of the products (a toaster, gas BBQ and waffle iron) from the 1950s that have the "Kirchman Bros" emblem on them - and yes, they still work and are used regularly! The Kirchman family home is one of the historical Center Street homes (1315 Center St). Thank you so much for helping to preserve Bay City's history!